People might tell you to avoid all but the shallowest of root vegetables if you’re growing food in pots. But I don’t think this is sage advice. There’s a lot to be said for expanding your potted root repertoire beyond the usual players like radishes. It’s not just that carrots come in lots of pot-friendly varieties like Parmex and Parisienne, but it’s also about their ideal growing conditions. 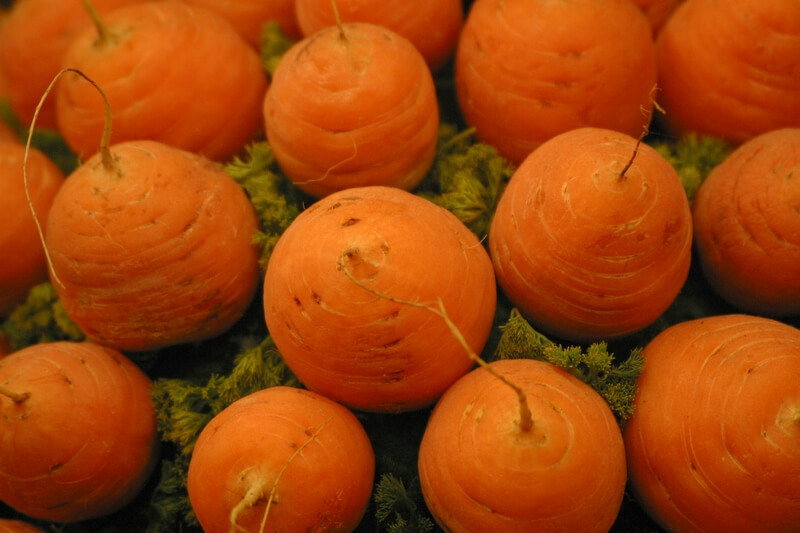 Carrots are quite unusual in their soil preference: they like it fertile and free-draining. As far as I’m aware, competition-growers tend to favour big containers (with lots of fertilizer) as opposed to good ol’ soil. Or else they’ll make a cone-shaped hole in the ground and fill it with pre-made potting mix. The wonderful thing about carrots is that they’re fast-growing and, as I’ve just said, come in a range of golf-ball and finger-shaped varieties. You can plant two crops if you want: an early short-rooted variety sown in April which will be ready in June, and a long-rooted variety sown between April and June to be pulled in October. You can even plant a small variety in August for baby roots in November and December. Adaptable, eh? There are, of course, a few things to be wary of. The dreaded carrot fly is one nemesis but, to laud the benefits of container growing again, can be overcome by making sure the rim of your pots are at least 60cm/24in. from the ground. Carrot flies can’t fly much higher than that so plants will be protected. Anyhow, enough introduction. Let’s dig into the specifics of sowing, growing and harvesting. Germination/sprouting time: 14 -21 days. Time from sowing to harvest: 3 - 4 months (early). 4 - 5 months (maincrop). Size of pot: Large (min. of 12 inches depth). Difficulty of growing in pots? Easy - medium. There are a lot of potting mix options for carrots, particularly because so much attention has been given to growing show carrots. If you’re interested in learning about some of the more complex options this article from John Trim is a great resource. Globe-shaped varieties are excellent for pots. Assuming you’re not after a “first place” badge, use 2/3 store-bought potting soil with 1/3 horticultural sand mixed in. Also make sure you add a few handfuls of slow-release fertilizer or be rigorous with your feeding schedule (more on that in a moment). Make sure there aren’t any rocks or big particles of debris. Carrots prefer full sun, so keep them out of the shade as much as possible. Seed sowings are best made directly in the pot as carrots don’t like being transplanted. Triple up on the amount of plants you expect to grow (so if you intend to grow five plants, sow fifteen seeds), thinning out to keep the strongest. Broken foliage can attract carrot fly so pull out the whole seedling (gently) or bury the snipped-off stub. You can pack quite a lot of carrots together in pots. I recommend leaving a minimum of one inch or so between seedlings. I tend not to go much more than that. For an early harvest – If you can provide some protection, or you’re lucky enough to have a warm city microclimate, then you can sow as early as March. Alternatively, sow indoors and plant out when the weather warms up. Use peat pots to avoid stressing the plant when you transplant it. A variety with short roots will be ready around June or July. 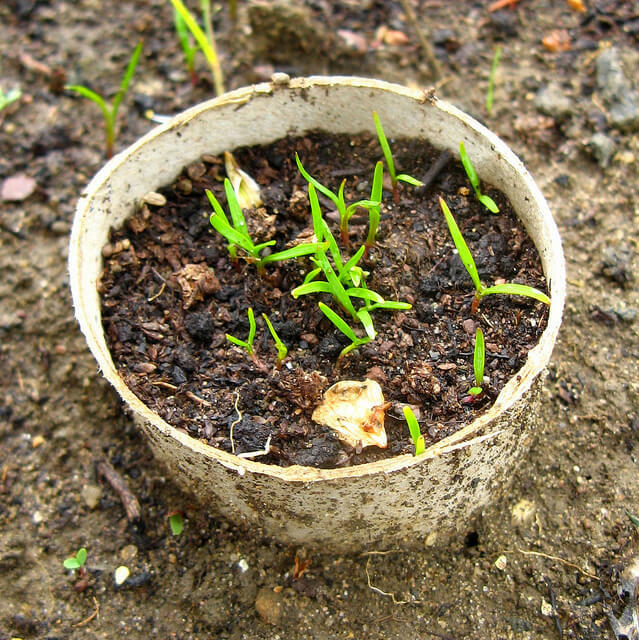 Peat pots can be used to avoid stress from transplanting. For a mid to late summer harvest – Sow from April to June for picking in September and October. I always recommend short-rooted varieties for pots but if you have a taste for long carrots, or want to try some more unusual varieties (like purple or yellow types) then late spring and early summer is the time to sow. For a late (November – December) harvest – Sow a small-rooted variety in August for a harvest in November and December. They’ll likely be “baby” carrots that aren’t fully grown. Bubble wrap pots and use makeshift cloches if possible. Choose as deep a container as possible. Polythene patio planters are a good option as they can be reused and cleaned every year. Feed regularly. Carrots will benefit from a regular weekly feed or a good dose of slow-release fertilizer added your potting mix. Water regularly. Part of the challenge of growing carrots is getting enough water into the sandy free-draining soil. Water regularly, especially in the hot summer months. Regular watering will also prevent the roots from splitting, which can occur because of heavy watering after a period of drought. If crowns (the top part of the carrot) are poking through, just “mound up” some soil around them. Loosen the soil with a hand fork and snip off leaves about 1cm (1/2 in.) above the crown. Store carrots in slightly damp sand, making sure that they don’t touch. They will store for up to five months. Baby carrots taste wonderful when eaten raw. 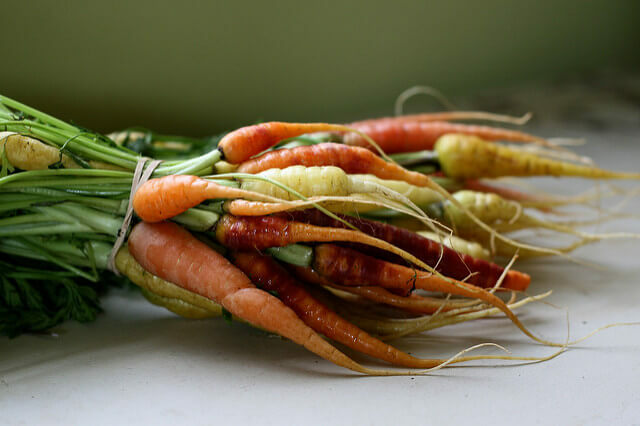 If you’re planning on eating your carrots raw, lift maincrop varieties a little earlier. The leaves are edible! I actually quite like the flavour of mature carrot foliage. I think they work particularly well in soups, where they add an extra dimension. 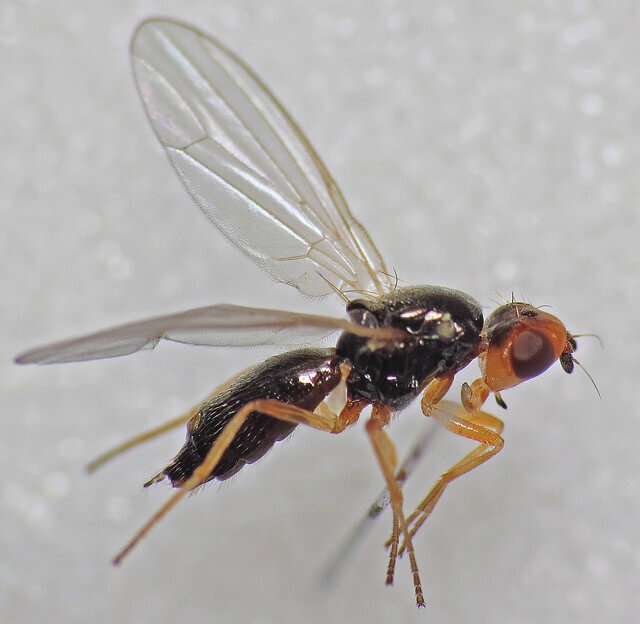 Carrot fly – This is one area where container growers have a major advantage. Carrot flies tend not to fly higher than a metre so prevention is simply a case of lifting our pots out of the danger zone. My preferred pot is a long terracotta one that I stand on an old chimenea frame. There’s an interesting “study” currently being conducted by the Royal Horticultural Society which examines the ideal height of barriers used to repel carrot flies. As a general rule, 60cm/24 in. is a good benchmark. Carrot fly larvae eat away at the roots. Green tops – Green tops are a result of exposure to sunlight. They make the affected area a little bitter but still perfectly edible. Split roots – Split roots (as opposed to forked roots) where the carrot has split down its side can be a result of heavy rain or heavy watering after a long dry period. Eat them straight away (don’t store). Chantenay Red Cored – This variety will grow up to 5 1/2 in. long and is ideal for container growers. It’s a traditional variety and you’re looking at under three months to harvest. Caracas – Even shorter in length than Chantenay Red Cored (2-3 in. ), Caracas is good for close planting in containers. Parmex – A popular globular variety that reach up to 5cm (2 in.) in diameter. Chantenay Red Cored – Available in the UK as well as the US. Caracas – Same point as above. Nandor F1 Hybrid – From the “Kew Urban Garden Collection”, this variety is the longest listed here (root length of up to 12 in. ), but still good for growing in pots. Rondo – Small, golf-ball shaped variety that’s really fast-growing. Great choice for an August sowing. 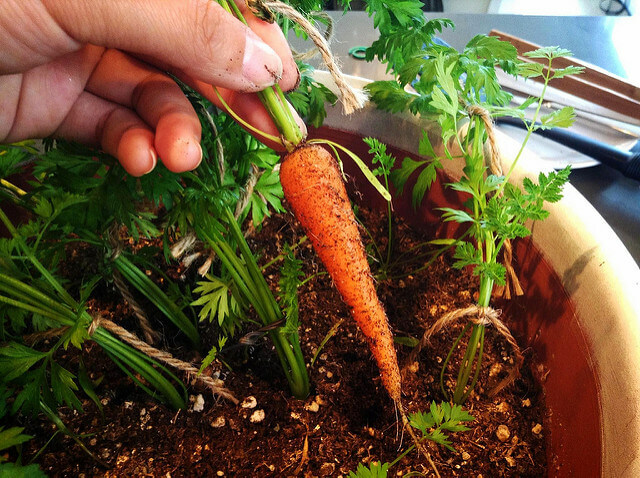 Have you tried growing carrots in containers? Leave a comment below and let me know how it went!